Apologies for the delay. Here are the Foxkeh wallpapers for September, 2008. 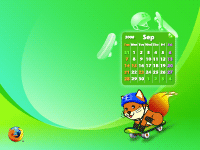 This month, Foxkeh is skateboarding. As Foxkeh is only a small fox, he's riding the skateboard like a go-cart. It must be fun to go skateboarding, but don't forget your helmet. What sport would you like Foxkeh to try next month? I think table tennis would be quite cool...only thing is, who would Foxkeh play with? Thanks for the new wallpaper- so cute! I'm so happy Foxkeh's available for Firefox 3 now. Maybe he could wear a costume next month? Because it's Halloween.